HBO/Youtube‘Last Week Tonight’ with John Oliver. John Oliver was exceptionally exasperated with the United Kingdom’s politicians in the wake of the so-called Brexit vote last week. 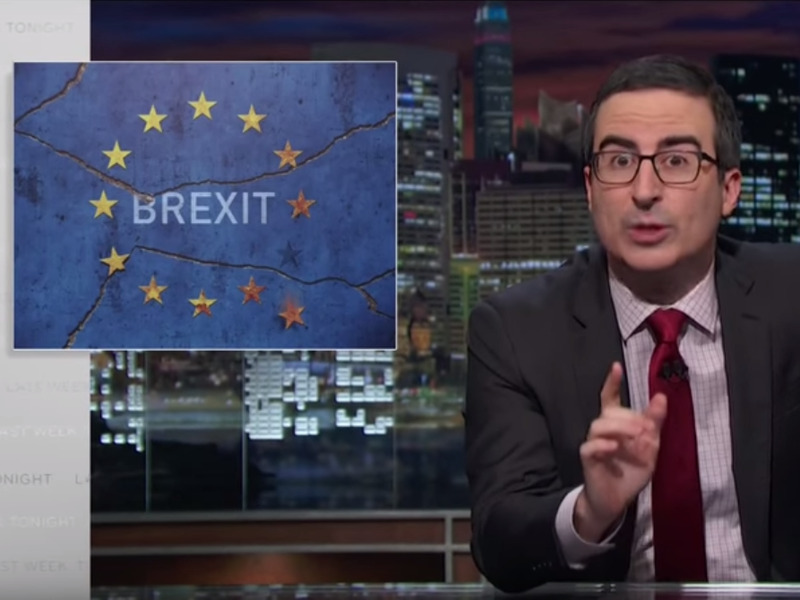 Following the UK’s vote to leave the European Union, the “Last Week Tonight” host took aim at Prime Minister David Cameron, UK Independence Party leader Nigel Farage, and former London Mayor Boris Johnson during a segment on his show. Oliver, who vocally advocated for remaining in the EU on his show last week, went after Farage and Johnson for pushing a narrative he felt was disingenuous. Calling Johnson “a shaved orangutan with the hair of Owen Wilson” and Farage a “three-time cover model for ‘Punchable Face’ magazine,” Oliver poked fun at the pair’s assertion that June 23 now serves as the new “independence day” for the UK. Cameron also drew Oliver’s ire. Despite his vocal advocacy for the “Remain” camp, Oliver pointed out that the entire reason for the vote was because Cameron called for it (at least partially for political reasons). He also highlighted the backtracking of “Leave” advocates on some of the claims made during the campaign, many of which had been debunked before the vote. That included Farage’s admission the day after the Brexit vote. During a television interview, Farage suggested a claim made by the “Leave” camp — that the UK would instead be able to use about $350 million it was sending weekly to the EU on its National Health Service — was not entirely true. Oliver also laid out that after Cameron’s exit, the next prime minister will have a massive task ahead. “On top of which, they will have to settle outstanding bills with the EU, hammer out new trade deals with dozens of countries, sift through thousands of EU regulations and decide which ones to keep, and figure out how migration will work. And all the while lives hang in the balance,” he added. Oliver wrapped up the segment by showing an interview with a Portuguese immigrant to the UK. She has a child born in Portugal and one born in the UK, and she said she didn’t know what to tell her kids when they asked what will happen to them. In the wake of the Brexit, financial markets have crashed and the UK political scene is in turmoil.